Lifehack is powered by Vocal. Only the best for you and the one you're with when you buy the best mattresses. I did it! I finally saved enough money by eating cheap meals and making a lot of dollar store purchases that I can afford a really nice mattress. It's basically going to be the only item I own, so I'm going all in! On the weekends I'll let my son Jarret sleep in my bed and I'll use an air mattress. That way he can associate the best sleep of his formative years with me! When I have the company of a woman beneath my sheets, she'll appreciate that I have a high thread count, firm support, and the right pillows to cradle her head. I can't help that I care so much; I'm a demisexual! I only experience sexual attraction when I've formed an emotional connection. That why my bed has to be sweet; my sweetie's going to be in it! The Leesa Sapira is one of the best mattresses you can buy according to Business Insider. This mattress is basically best in show thanks to six layers that include memory foam and pocketed coils. It's great for any position, firm but with some give, and its cover is a single soft piece of fabric. Some people think sleeping in separate beds can actually be good for couples. The Sapira is the next best thing because it reduces motion transfer caused by your sleeping partners. Sometimes I'm a snuggler and other times I roll to the very edge of the bed. I don't want to be a disturbance! But if there's a disturbance in the bed I'll gladly provide comfort. Casper is one of the best mattresses, and not just because they sponsor a lot of great podcasts! Layer after layer of foam has made Casper a perennial favorite. Doesn't hurt that it's affordable too, although the Casper Wave is pricier because it has different types of foam meant to facilitate cooling and reduce motion transfer when you change sleep position. Those are both features that the Sapira also has, but Casper has been around longer so there's less of a fear that the mattress will fall short of your expectation. It's important that your expectations of the mattress don't obscure what the mattress actually is. Luckily, you get 100 days to test the mattress before committing to it, which is great so long as you don't like the mattress a lot without the mattress reciprocating. It's hard to let go of a mattress. WHAT AM I EVEN TALKING ABOUT?! Sleep apnea: symptoms, causes, and remedies. This may be a familiar topic for you. If you go the surgery route, you may want to celebrate by getting yourself a great new mattress. And Tuft & Needle must have one of the very best mattresses because they have over 6.5k reviews on Amazon and their rating is still 4.5. 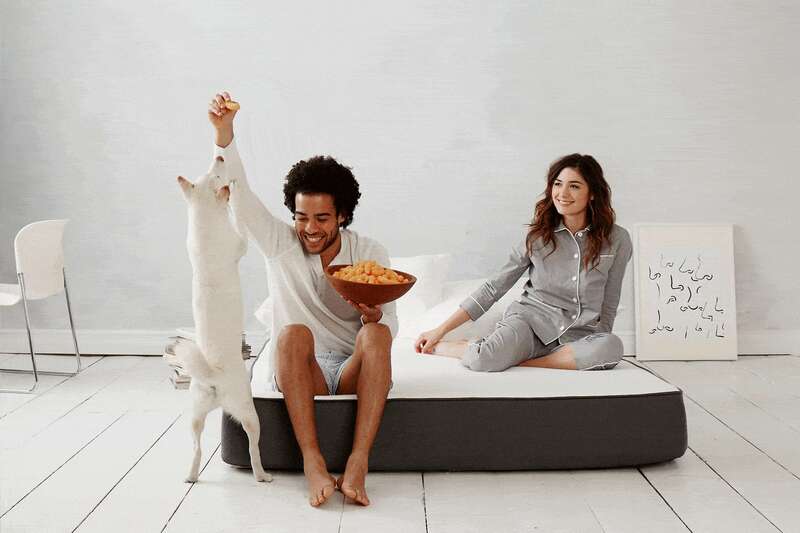 I've been told I share many of the selling points of the T&N mattress: supportive, comforting, and bouncy. I'm a lot of fun, I roll with what's happening, and I'm non-judgmental. So, of course, that means I'm GGG! But I'm also firm, which this mattress is not. This mattress is more neutral. I can't be neutral because I feel that I would be doing a disservice as a mattress to not speak the truth my partner needs to hear. The Purple mattress must be one of the best mattresses around because it gets good reviews despite being gimmicky. It's a grid of hyper-elastic purple polymer on top of support foam. It provides comfort and relief to the lower back and shoulders. Just like me because I'm great at giving massages! Purple accomplished this by providing support without sink. I accomplish this because I'm intuitive and touch is one of my love languages. This mattress also doesn't absorb heat, which is good because I can be as warm as a space heater. This is one of the best mattresses according to my friend John. He likes his Lull so much that he bought one for his mom! Lull has a top layer meant to keep you cool, a foam layer to provide support, and a base that promises to provide support for years to come. Some users reported that the Lull is too firm, but it loosens up with time. I promise to provide support for years to come too! I always intend to not make that my opening gambit because I worry that it'll come off as too much. I just wouldn't want to waste my time or anyone else's by not being serious. For a while, I thought this was unique to me, but then someone rhetorically asked, "What does demisexual mean? Here are 6 signs that you may identify as demisexual," and I learned I was not alone. This is one of the best mattresses around because it's affordable and protects against motion transfer caused by changes in sleep position. Nectary provides a trial period of 180 days, and it comes with a lifetime warranty! I can make the same promise because to quote Mr. Rogers, "Love isn't a state of perfect caring. It is an active noun like struggle. To love someone is to strive to accept that person exactly the way he or she is, right here and now." That's the kind of support I want from a mattress! Remedying sleep troubles is just one reason why you should drink cannabis tea. You can also try getting the Eight Sleep Saturn mattress. It's one of the best mattresses because of all the tech it offers. You can monitor your sleep, heart rate, and breathing. You can sync it with your Alexa so that as soon as you get up your coffee maker makes you a cup. And you can even control the temperature of your bed! That's the sort of caring partner I'd be too. I'm luxurious, which means I'm someone who dotes on and really adores his partner. But not to the point of submissiveness. I'm my own mattress too! Ghostbed Luxe sounds like the Carlos Danger of mattresses, which is bad news because that's the name Anthony Weiner used for his sexting escapades. In reality, this mattress is more like Mission Impossible: Ghost Protocol in that it's an addition to an existing franchise (foam mattresses) that's surprising in its delivery. You get pressure relief and temperature regulation on a budget! We have the opportunity to meet Joe, Nest Bedding's mattress mastermind. Joe says that, "The idea of gathering natural, local materials, and vendors, much like a bird does when it is nesting, grew and grew until I was finally ready to start my own venture." Sounds like the makings of one of the best mattresses! Nest has foam infused with copper and a system of coils, which translates into pressure relief and support, which I also do by providing a non-judgmental ear, emotional validation, and a great sense of humor. This is what I slept on for months while saving money for one of the best mattresses. You can tell it's good because it has over 1,500 reviews and an average rating of 4.5 stars. Enough disappointment would bring that number down, but the amount of satisfaction this mattress delivers keeps the rating sky high. What really helps is the quilted top. It makes you feel like you're somewhere you belong, which is how you'll feel sleeping in the crook of my arm. I don't believe in true love; I believe in many loves that you have to work hard for. You learn something from all your loves, just like you learn something from all your mattresses. What I learned from the King Koil is that going all out isn't a luxury if the alternative is getting less than you deserve. Long commutes means lots of tunes and podcasts. Daydreamer and people watcher. How to Clean up Slime!